Lear Capital has been a household name in precious metals IRAs for over 20 years. The company has conducted more than $3 billion in transactions, easily making them a top pick by consumers for precious metal investments. After taking a deeper look into Lear Capital, we found a company that offers clients useful customer service benefits including a guarantee for smooth transactions, a no-fee buy-back program and professional staff to help consumers fully understand the transaction and answer any questions. All things considered, Lear Capital gets our 2018 "Best Service" award. Lear Capital's educational resources are great for new gold IRA clients. Their excellent customer service is great for customers of all types. 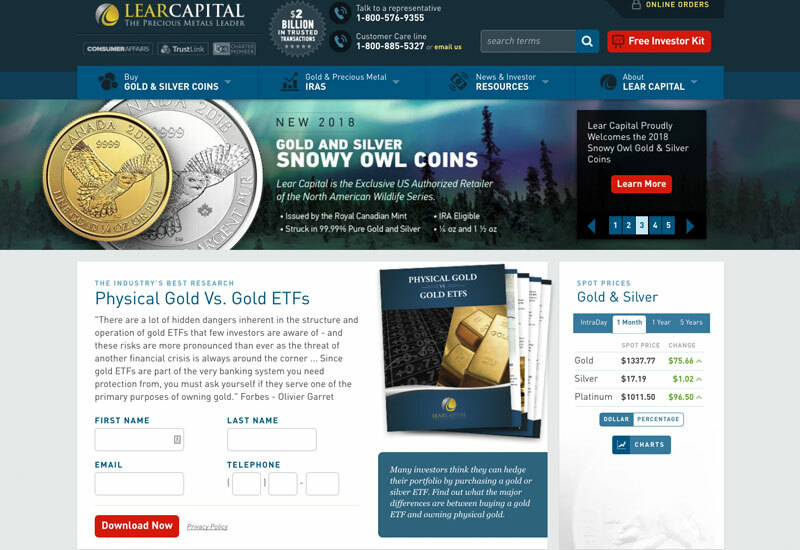 After contacting Lear Capital and requesting a gold IRA investor kit, we found it’s clear the company works to educate their customers about Gold IRAs. While the kit is helpful, we found their website is especially useful and is packed with resources for consumers to examine. Similarly, a customer care line is staffed with knowledgeable representatives. So how does Lear Capital compare to other Gold IRA companies? We recently updated our guide to choosing a Gold IRA and found Lear Capital stood out for its commitment to customer service. Lear Capital encourages customers to invest in precious metals by purchasing gold, silver, and other precious metal coins that are compliant with IRS guidelines for IRAs. While other companies can help you invest in a gold IRA, what sets Lear Capital apart from their competition is their customer service. Lear seems to understand how important it is for their consumers to have a clear picture of every step taken in each transaction. Each customer is assigned a customer representative to help guide customers through each step of the process. To invest with Lear Capital, you will need to start an IRA Precious Metals Account, which can be done through Lear Capital with their in-house Individual Retirement Account (IRA) Processing Department. After opening an account, the company will work with your current IRA to rollover IRA funds. Next, Lear Capital will assign a personal representative, who will work with you to choose which gold IRA to purchase. The website easily describes (including pictures) these purchase options. Coin prices shown on the site change throughout the day because coins are priced at the real-time price. Once the customer is ready to checkout, customers have 10 minutes to complete their order to keep the price for the coin at the price it was chosen before it changes. After the customer purchases their coins, they have 48 hours to complete payment for the order. They can either wire the money over the phone to Lear Capital or mail in a check. Because it takes about two weeks for a check to be processed, Lear Capital suggests wiring the money over the phone, which takes about a week to process. Once the coins are purchased, the consumer signs the Shipping and Transaction Agreement ensuring the coins will either be shipped to the consumer or placed in the Brinks Coin Depository. There is an annual fee of $160 for insurance, shipping, quarterly financial statements and 24/7 online access to their account. 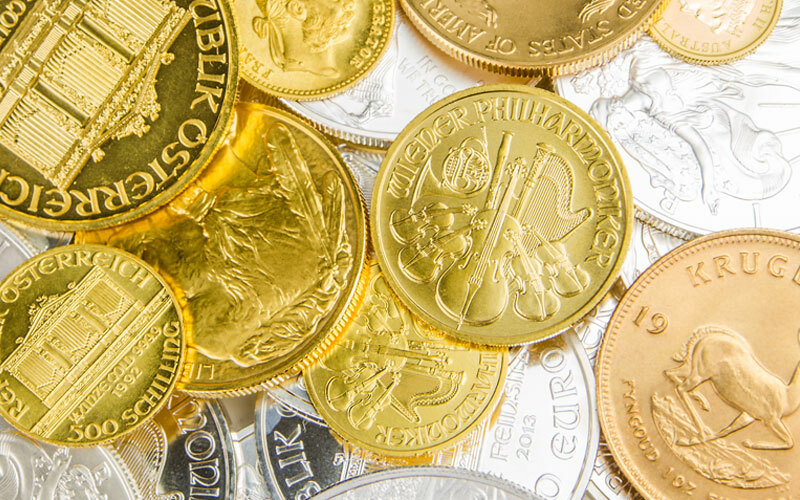 As of February 2018, the company does not charge an application fee, but may charge storage fees and commissions on the purchase of gold. The minimum investment at Lear Capital is $7500. Consumers are buying precious metals because of their time-honored inherent value. Even when the economy performs poorly, precious metals can maintain value – or may appreciate in value. In contrast, a conventional IRA may lose value if the economy plummets. For this reason, gold and other precious metal IRAs are considered a hedge against market risks. As Lear explains, when you’re ready to retire and withdraw funds, a Precious Metals IRA can give you an option not found with regular retirement accounts: the ability to physically possess your metals to continue distribution. You also have the option to liquidate your account, though it will subject you to annual Required Minimum Distributions (RMD). For the tax implications and more information on Gold IRAs, read our tips for a Gold IRA buyer. What Do Lear Capital Reviews Say? Generally, consumer reviews suggest Lear Capital operates with outstanding customer care. They say Lear Capital wants to educate them before they make a purchase so they are making a good investment. Most note they do not feel pressured to make a purchase if they do not want to, but liked the representatives contacting them to make sure they are taken care of. Other consumers mention Lear’s customer care team is very professional and handles problems with ease. In short, Lear Capital is known for excellent customer care and professional transactions. Complaints about Lear Capital are mostly about Gold IRA performance. While Lear doesn’t have any control over precious metals prices, they are available to help customers manage their account. There are several ways to work with Lear Capital. First, the company has an informative website where consumers can call or email a representative or order or sell coins online. Most of their business is done over the phone with a personal representative that is assigned to the consumer. For customers that prefer to talk in person, you can arrange a meeting at their corporate offices in Los Angeles, California. Almost all complaints we found address flucuating precious metals prices and the losses associated with them. Does Lear Capital buy back coins? If at any point the consumer would like to sell back their coins, Lear Capital cannot guarantee they will buy back the coins. If Lear Capital were to make any offer to buy back the coins, they can offer to buy back the coins at the market price at the time of the buyback. Where is Lear Capital gold stored? Gold is stored in a Brinks Depository in Salt Lake City, Utah. The gold is insured by Lear Capital and while it’s at Brinks, it’s insured by Brinks’ insurance company, Lloyds of London. What are the typical Lear Capital fees? Each year the customer will be charged $160. This includes storage for the coins, insurance, quarterly financial statements, and 24/7 access to their account online. There are also commissions on the purchase of gold, and storage fees. What are Lear Capital’s credentials? Lear Capital is a member of the Industrial Council for Tangible Assets, the Business Consumer Alliance, Trust Link, Numismatic Guaranty Corporation, and the Professional Coin Grading Service. Lear Capital values educating their customers before they make a purchase, making them a serious Gold IRA consideration. If you are interested in purchasing precious metals you can call 888-717-0870 or use their online order form. STAY AWAY. I had 14 thousand dollars. I decided to invest in precious metals. Lear Capital looked like it had good reviews. I knew absolutely nothing about investing in silver. So I trusted the person I was talking with. He told me about these great coins. Canadian Arctic Fox 1 5 ounce coins. Low mintage 1.5 oz instead of 1 oz. Semi numismatic I guess giving it some collector value. At the time spot was around $20 oz. This coins were selling at $45 dollars each which was $30 oz. 50% premium or there about. I bought 300 of them. $13,500 dollars. :You can't go wrong Mr. **this is a wonderful investment." Today Spot silver is around $15 oz. I just bought the same coin for $2.50 over todays spot. Bottom line is I was sold bullion coins at a huge premium when I would have been better off buying Canadian Maple Leafs. It wasn't about me it was about them. BE CAREFUL.